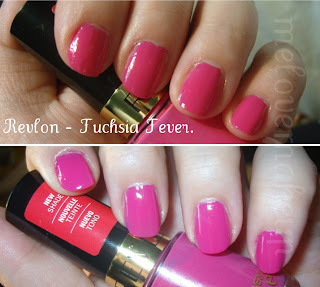 Sophsterlicious • UK Blog: Revlon Fuchsia Fever Nails! Revlon kindly sent me some gorgeous goodies to try out a while ago, and one of the items was this new nail polish shade, Fuchsia Fever, It's stunningly bright and eye catching. Revlon polishes apply really nicely in my opinion. The formula is quite thin, but that saves it from getting gloopy and difficult to apply. To get an opaque finish I used two heavier coats. The Revlon Range is available from Boots and Superdrug. This nail polish is £6.29. WOW! I love this colour! !